An extra-large Max Zorn tape art installation was featured in the 16th Century courtyard of the historic Amsterdam Museum for the country’s annual “Museum Night” (Museumnacht). Max Zorn partnered up with StreetArt.com for their showcase of a handful of curated artists for “Amsterdam DNA: Street Art”. 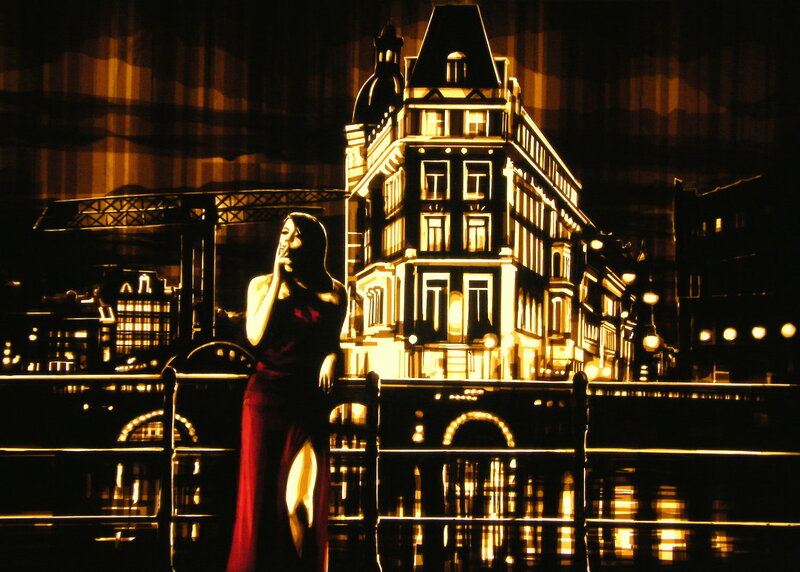 The result was a 2m x 2m (6ft x 6ft) installed showpiece of “My Night, My Town”, an Amsterdam themed artwork created with brown and ruby packing tape on acrylic glass. Using the indoor lighting of the museum’s cafe and lounge, Max installed the work a large window of the museum. “It was as if you were peering into a romantic, elegant and shimmering scene happening that night in Amsterdam,” said Stick Together Arts founder, Audrey Sykes. Curated by Streetart.com, the installation included other heavy hitter urban artists like Skount, TelmoMiel, Super A, Laser 3.14, Bustart & Zaira. Finished artwork, “My Time, My Town” by Max Zorn, brown and ruby packing tape on acrylic glass.